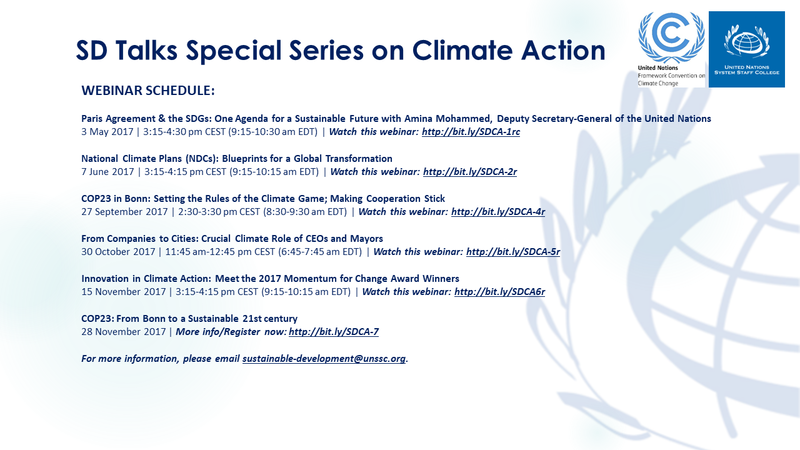 Patricia Espinosa invites you to join the SD Talks Special Series on Climate Action, a webinar series organised by the UNSSC Knowledge Centre for Sustainable Development in partnership with UN Climate Change in the lead up to and during COP23. This webinar series was conceived to set the stage for COP23 which took place in Bonn in November, and to further discussions around climate change and sustainable development. Join us for the opening session of our 7-episode webinar series on Climate Action with Amina Mohammed (Deputy Secretary-General of the United Nations), Nick Nuttall (Head of Communications and Outreach at the UN Framework Convention on Climate Change). This first webinar will focus on the link between the Paris Agreement and the sustainable development agenda, and will look at how this mutually reinforcing relationship affects their implementation. At the end of the discussion, participants will have the opportunity to ask their questions directly to the speakers during the live Q&A session. Watch this webinar now! The Paris Climate Change Agreement set the goals, and now countries must translate them into action. The Nationally Determined Contributions (NDCs) set out what each country plans to do as part of the Paris Agreement to contribute to the international effort to secure a sustainable future for all. This webinar will explain how NDCs open up a new universe of economic and cooperation opportunities to realize the mitigation and adaptation plans and increase climate resilience. Webinar#3 | Climate Finance: Can Countries Really Bank on It? Boosting financial flows and greening investments into a low-emission, resilient transition will be key to meeting the aims and ambitions of both the Paris Climate Change Agreement and the Sustainable Development Agenda. A transformational change is needed in our financial systems, banks and investments to enable sustainable business to become the necessary new norm if we want to realize the promise of a clean and sustainable future for all. This webinar will explain the current climate finance scenario and will outline the major opportunities for financial institutions and public and private investors. The new date and time of this webinar will be communicated in due course. Between 6-17 November, thousands of government delegates and leaders from all sectors of society will gather in Bonn (Germany) for the 2017 UN Climate Change Conference. Under the Presidency of Fiji, the UNFCCC secretariat with the support of Germany will host this annual meeting with one clear objective: making progress for a successful, inclusive and ambitious implementation of the Paris Agreement. This includes negotiations on the rule book—or operating manual—for transparent climate action under the Paris Agreement, as well as showcasing cooperative climate action, including on vulnerability and resilience, from around the globe. This webinar will explain the milestones and key challenges that lie ahead of COP 23. Non-Party Stakeholders are essential in the global effort to realize the goals of the Paris Agreement. The UNFCCC's NAZCA Portal showcases thousands of leading examples of game-changing climate actions from the private sector, cities and other sub-national governments. More commitments and urgent actions are needed. Wide-ranging cross-sectoral partnerships will be fundamental for nations to fulfil their objectives. This webinar will explain the great momentum for more ambition and cooperation from all parts of society. The exact date and time of this webinar will be communicated in due course. During COP 23, the people behind some of the 2017 Lighthouse Activities of the initiative Momentum for Change will demonstrate how they are creating positive impact in the lives of people, communities and on the planet´s health, through innovative approaches. The Momentum for Change initiative is spearheaded by the UN Climate Change secretariat to shine a light on some of the most innovative, scalable and replicable examples of what people are doing to address climate change. The exact date and time of this webinar will be communicated in due course. 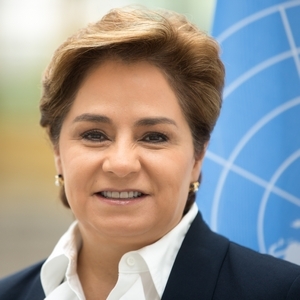 This webinar will feature Patricia Espinosa, Executive Secretary of UNFCCC, who will discuss the key outcomes of COP 23, including with respect to the negotiations and the implementation of the Paris Agreement. This webinar will also highlight the measures undertaken by non-party stakeholders and will underline the next steps following COP 23. The exact date and time of this webinar will be communicated in due course.